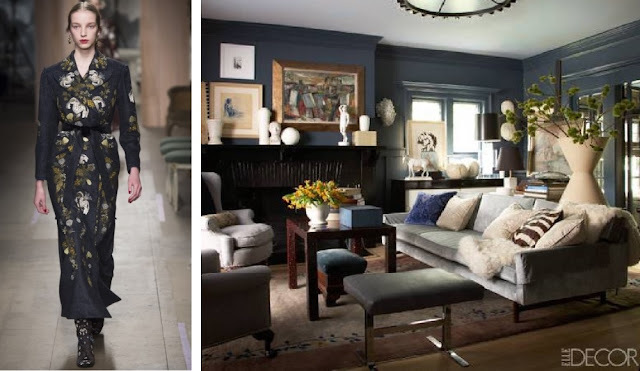 It seems lately, when browsing Interior Designer Portfolios, I naturally gravitate towards the Designers own home. Such is the case for this Brooklyn, Brownstone. It wasn't until I started researching that I found that it actually belonged to Kathryn Scott, Interior Designer and artist. It was very difficult to select just one residence to feature, but this one I returned to several times, when I finally decided to feature it. What captured my immediate attention was all the natural wood and plant life, especially the Ficus Trees above. This statue is beautiful, a rarity. The woman's figure is elegant, it's wonderful weathered, torn and broken, but truthfully I wish she had a head! The home has a mix of Asian, heirloom and numerous antique pieces. She has offices in Shanghai, as well as New York. She has lived in the home since the 80's, and renovated/restored it to meet the need of her family, keeping all the incredible furnishings she has collected over the years. The amazing dining table above, is split down the middle, made of a single slab of Cypress wood, and was a gift from Kathryn's mother. It's not styled as such here, but the room above actually belongs to their young daughter. You can see more pictures in the link below. This home is filled with incredible history. The bed below was inherited from Kathryn's grandmother. It seems every piece was handed down, discovered in some remote place, or on a far off journey. It has a very old world feel to it which brings instant comfort. The wood and plants, and colours are inviting. If you are interested in seeing more, there is a great interview with Kathryn Scott and an extensive gallery of her home, here.